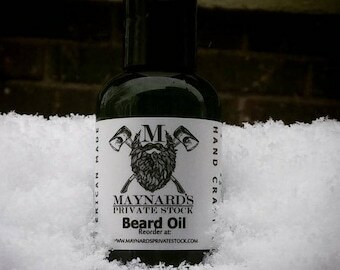 Announcement Buy Premium Beard Care for the Original Man at Maynard's Private Stock! We specialize in offering small batch beard oil and bear balm at an affordable price. Beard Kits provide 1.50oz of beard oil and 2oz of beard balm. Buy Premium Beard Care for the Original Man at Maynard's Private Stock! We specialize in offering small batch beard oil and bear balm at an affordable price. Beard Kits provide 1.50oz of beard oil and 2oz of beard balm. Excellent product so far.Shipped on time but misplaced at the post office. Hi, I'm Joe Trinosky, founder of Maynard's Private Stock. My passion for "bearding" and the art of manliness introduced me to beard balms and oils in order to tame and maintain my beard. Since then, I have been on a continuous search for the "perfect" product to help maintain a healthy, luscious beard. As the beard movement has grown, so has the need for quality products like beard oil, balm, mustache wax, natural shaving products and soap/conditioners. I have tried many products on the market for my beard and have always been left desiring something a little different (less oiliness, different scent, better absorbtion and more natural feel to be among the laundry list) and have not been able to find the product that just felt right. This search is how Maynard's Private Stock was developed and came into fruition. Through an extensive research and development phase where I used myself and my friends as "test subjects" I finally created a blend of carrier and essential oils that resulted in a product that I'm very proud to call my own and share with you. I am confident that your search will end here as well, once you've used Maynard's Private Stock. I also feel that it is worth noting that Maynard's Private Stock uses 100% all natural ingredients. We support small businesses with the strong value and commitment to their products that drive my like minded pursuit of offering great products. You will also find something unique about Maynard's Private Stock as I intend to share a wealth of information and commentary on all things bearding and also shaving, along with other topics on our blog, "Maynard's Musings." Join in the conversation! I hope you enjoy the products and information in the store, blog, etc. I would also love to hear from you. Come on over to Maynard's Private Stock Facebook Page and talk bearding with me. You can also find Maynard's Private Stock on Google+, Twitter, and Instagram. But make sure not to leave before taking a gander at our collection of premium, all natural beard and face products! Maynard's HQ is based in Indianapolis, IN and I look forward to sharing a little bit of Indiana with each of you.